Secrets Aura Cozumel | Save up to 20% on Cozumel Hotels! Book a stay at Secrets Aura Cozumel and discover a tropical paradise! Discover how vacations were meant to be at Secrets Aura Cozumel! Secrets Aura Cozumel is a gorgeous adults-hotel luxury resort set on beautiful Cozumel Island. The spacious 266-suite hotel boasts a variety of ocean view and garden view room options, all with private terraces and balconies offering spectacular tropical views of the property. 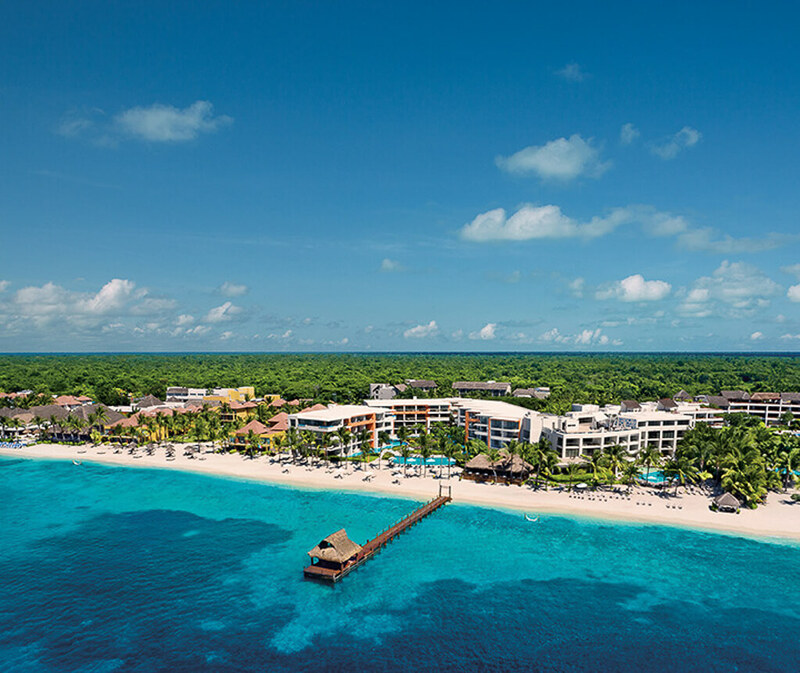 Set in front of a wonderful stretch of beach and its mesmerizingly tranquil azure waters, a getaway to Secrets Aura Cozumel is an escape to tropical bliss. Secrets Aura Cozumel offers guests a variety of accommodations options that should keep everybody happy. 219 Jr. Suites are available throughout the property, with options of pool views, ocean views, and luxurious swim-up pools. For an additional price and added luxury, guests can choose the Preferred Club upgrade. Among the included amenities are limitless gourmet dining, exclusive access to the Preferred Club installations, and premium drinks at three bars and lounges throughout the resort. Secrets Aura Cozumel offers guests the options to choose between four à la carte restaurants, one international buffet, a 24-hour coffee and pastry shop, and around-the-clock room service. In addition, Secrets guests can also take advantage of the great dining options available at its neighboring sister property, Sunscape Sabor Cozumel. As part of their Unlimited Luxury all-inclusive program, Secrets Aura offers an array of luxurious amenities to pamper guests' palates, senses, and interests. ✓ Free Wi-Fi and free international calling to the US, Canada and local landlines with Unlimited Connectivity. Secrets Aura Cozumel boasts world-class wellness installations at the Secrets Spa by Pevonia. The Secrets Spa by Pevonia offers specialty treatments, massages, facials, manicures, pedicures, a full-service beauty salon, and aromatherapy. In addition, the spa includes a soothing hydrotherapy circuit including sensations path, hydrothermal pool with geyser, waterfall, cold water plunge pool, and beds with invigorating air bubbles. Secrets Aura Cozumel offers the ideal resort destination to celebrate weddings, honeymoons, anniversaries, and even group events. The spacious grounds, unrivaled beach, private pier directly in front of the hotel, and access to the neighboring, family-friendly Sunscape Sabor Cozumel all provide Secrets Aura with all the elements needed for ensuring a successful celebration or event for groups of up to 400 people.